Highly recommended song contest for songwriters, lyricists & music composers | 2019 Songwriting Contest | 2019 Lyric Contest | Instrumental Conmpetition | 2019 International song contest. Lyric contests 2019 song contests 2019. Open to Songwriters, song lyricists & instrumental composers. 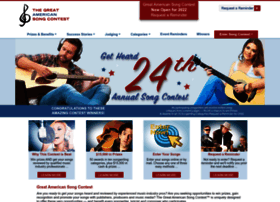 Worldwide songwriting contest and lyrics contest. song publishers, music producers and recording artists.